You. Me. Ride This Crazy Train - Adventures and Observations on The GO: Merry Christmas and I hope you have a lovely New Year's! Merry Christmas and I hope you have a lovely New Year's! 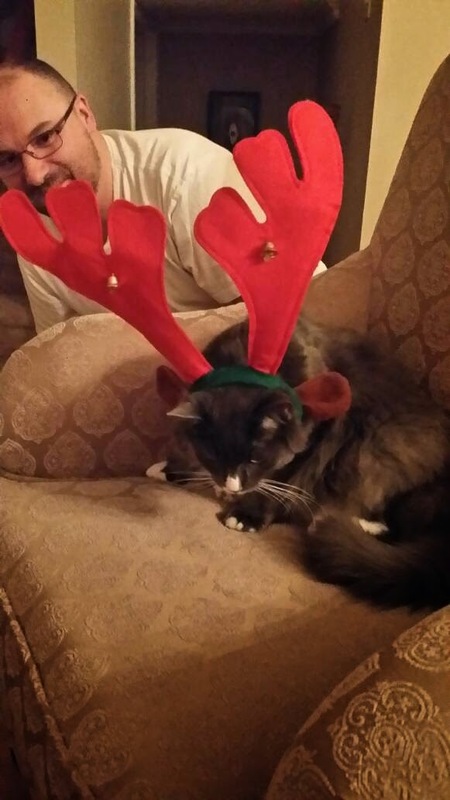 Lawyer cat, George, wasn't feeling very festive when my husband put his antlers on but he wishes you a Merry Christmas all the same. I wish you all a safe and happy Christmas vacation. Eat lots of turkey. Drink all the drank! I'll be back at this on January 6th. And how is that cat not either attacking the antlers or the hand holding them on? George shows no aggression. Ever. Amazing for a cat. awww... what a wonderful boy. Merry Christmas! Best wishes for a healthy and happy New Year for you and your family. Merry Christmas to you and yours, CJ! Thank you (and your readers) for a wonderful year of entertainment. I'm sure there will (sadly) continue to be an endless supply of ijits to chainsaw in 2015. All the very best to you! Merry Christmas to you and your family! I enjoy your blog - non-riders don't understand the special challenges of daily public transit. I thought I saw you on the bus last week, but was too shy to say hi in case it wasn't actually you. ^ If it's not me just apologize to the stranger and blame the drank. If it's me YOU TOTALLY MISSED OUT.